Automated size selection is a superior alternative to manual gel extraction, allowing scientists to save time and money, improve the efficiency of sequencing runs and analysis, and perform new applications with next-gen sequencers. The BluePippin system can be programmed to size select either “Targeted fractions” (Narrowest fragment range based on a target size; useful for Paired-end sequencing and/or Emulsion prep), “Range” (Set with start and end base pair values; useful for RNA-seq, Gentoyping by sequencing, ChIP-seq and MicroRNA) and/or “High-Pass” collections (Collects sizes above a base pair threshold; useful for Long-range genomics and Long-read sequencing). 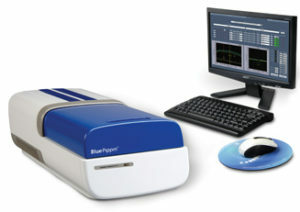 The BluePippin instrument includes a monitor, keyboard, and mouse. A CPU is built-in, an external PC is not required.